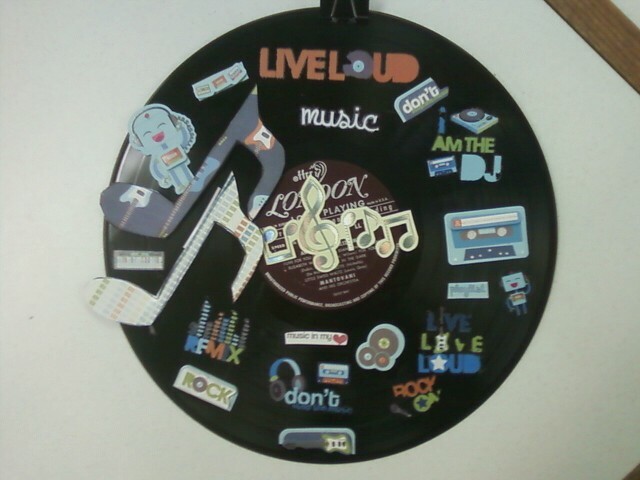 I spent part of this afternoon working on a new sign for the music corner of our youth department. 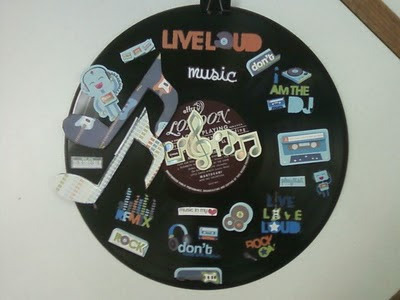 I combined craft foam, an old LP from Goodwill and scrapbooking paper, and stickers from the dollar store. It probably cost me less than $5 to make this and I think it will definitely add some personality to our department. Plus it was fun to make! I made a similar sign at my old library where I cut out musical notes and the letters of "MUSIC" from craft foam and this is basically the next stop. If I were to do it again, I would not have used rub-on stickers on the grooves of the record as that is why some of the transfers aren't perfect. Since it is a "rock and roll" themed piece of decor, I think it works, but other themes might require a more finished touch. I hotglued a binder clip onto the top and we will hang it from the ceiling sometime soon! Sorry for the less than awesome picture, it is from my cell phone camera. Oh well! Hope you like it!